An Oriental Whip Snake eating a Garden Supple Skink. Just one of the sights from our previous trip to Treetop Walk! We’re thrilled to be bringing you this special edition of our Herp Walk @ Treetop Walk! In an effort to promote awareness of Singapore’s natural and historical heritage, and to promote conversations amongst Singaporeans, the HSS is organising the Herp Walk @ Treetop Walk. We want to raise awareness, in particular, about Herps! These misunderstood creatures are often thought of as scary or unnecessary. But we want to show Singaporeans that Herps are important and integral to the Singaporean ecosystem! What makes this walk so special? We’re doing this walk as part of March For MacRitchie (M4M), a series of events happening in March 2016 as part of the Love Our MacRitchie Forest movement! Can’t make it? Fret not! Several other groups are doing guided walks for M4M! Check them out! So, come down for a lively walk along the Trail. Let the guides regale you with tales about the transformation of the entire area over the years. Learn about this green space that plays home to amazing biodiversity! If you’re lucky, you might get to see some of our scaly friends! Best of all, it’s absolutely free! So don’t wait and register at this link! At the forest edge, we came across four Common Sun Skinks (Eutropis multifasciata) basking in the sunlight that managed to stream past the canopy. Nearby, a troop of monkeys were walking around. It was saddening to see that one was chewing on a piece of plastic bag. Another had lost its leg. It was a reminder that human impact does not end with the people, but also the litter that is left behind. Shirley, one of our participants managed to collect the bag after the monkey dropped it. Along the way, she also picked up other pieces of litter. Bravo! A short distance away, Jonathan, the lead guide found some mating Fungus Beetle. It was very apt for Valentine’s Day! As we walked onward from the tree stump, Ing Sind came walking from the other side and said he had spotted a Gold-ringed Cat Snake (Boiga dendrophila)! The entire group walked in an orderly fashion to the snake. There were gasps as the magnificent creature came into view. As pictures were clicked, Sankar talked about the Cat Snakes and ethical herping. As the group moved on, we saw several Colugos (Galeoptera variegatus) and some Black-bearded Flying Dragons (Draco melanopogon). We even saw a baby Clouded Monitor Lizard (Varanus nebulosus) clinging to some wood. Overall, it was an excellent walk. Satisfied by the day’s turnout, we stopped at the exit and talked about the Love MacRitchie Movement and the Cross Island Line. We were very happy that several couples turned up for the walk. For this Valentine’s Day, we urged the participants to spread the love for misunderstood herps and for the MacRitchie Rainforest! Thanks to everyone who came! The Temasek Polytechnic Green Interest Group (TPGIG) invited the HSS down to give a talk at Bonita Tierra (Spanish for “Beautiful Earth”)! Despite the fact that it was raining on a Friday evening, there was a good turnout. It was very heartening to see so many people who cared about the environment. After a brief introduction, Sankar took to the stage and talked about Herpetology, and the reasons behind founding the HSS. He also talked about his close encounter with a King Cobra, and the regular Herp Walks that we conduct! Finally, Sankar wrapped up by talking about the Cross Island Line and the Love MacRitchie Movement. After Sankar, Rushan went up to talk to the students. Rushan had come in his capacity as a TP Alumnus and Ex-President of the TPGIG! He spoke to the students about the flipside of conservation, which is not always as glamorous as it appears on TV! He provided some fantastic advice to aspiring conservationists and drew on his personal experiences to make his points. He rewarded class participation with chocolate, a tactic which was very successful! After the talks, there was a pizza party, where we got the chance to interact directly with the students, who asked many prudent questions. We managed to sneak a selfie with all the HSS members who had turned up! A big thank you to TPGIG for organizing this wonderful event! We had a fantastic time. Are you an amorous amphibian lover? Or perhaps a lovable lizard-enthusiast? Join us on this special Valentine’s Day walk at Venus Loop! 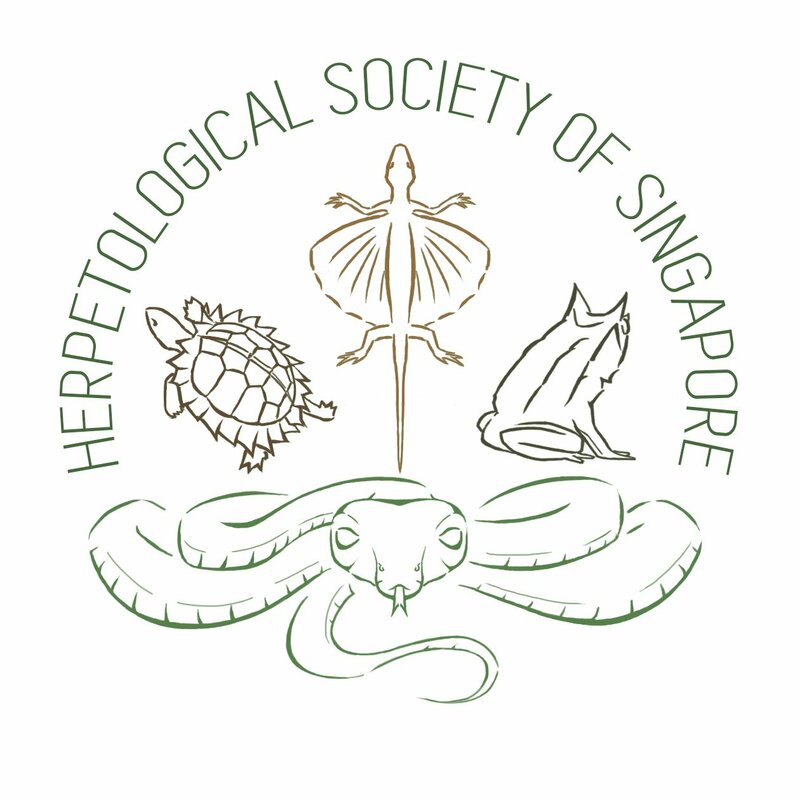 In an effort to promote an awareness of Singapore’s natural and historical heritage, and to promote conversations amongst Singaporeans, the HSS will be conducting the Herp Walk @ Venus Loop. We want to raise awareness, in particular, about Herps! These misunderstood creatures are often thought of as scary or unnecessary. But we want to show Singaporeans that Herps are important and integral to the Singaporean ecosystem! So, do come down for a leisurely stroll around the loop. Let the guides regale you with tales about the transformation of the entire area over the years. Learn about this green space that plays home to amazing biodiversity! If you’re lucky, you might get to see some of our scaly friends! Best of all, it’s absolutely free! So don’t wait and register at this link!